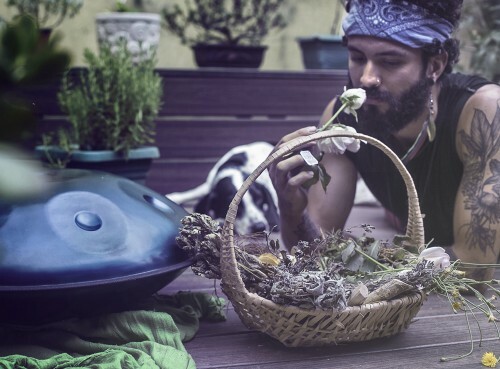 Have you ever wondered what living in an off the grid paradise is like ? A place where you feel in complete harmony and connection with nature and all of the elements, a place where you experience re-skilling activities such as making your own brews, harvesting the reap of the seasons bounty, or what about awakening and taking a walk down to a fresh water river to refresh and prepare for your day. Well, we were inspired after visiting places like Verd Energia and Rancho Mastatal in Costa Rica this past month. Shayna standing in a mandala garden at Inanitah Ecovillage and Spiritual Center on Ometepe Island. What if your daily ” work ” activities had to do with strolling through mandala gardens to collect loads of ginger, turmeric and what ever other goodies need harvesting for the day, or what about going for a foot mud bath to mix a plaster for a functional artistic reclining bench lounge, maybe have some fun making ginger beer or kefir hooch ( a delicious brew from fermented kefir grains and seasonal fruits from the orchard ) or your shift for the day may consists on getting creative in the kitchen and working up a new recipe with freshly gathered ingredients for the community to have a delicious meal, It could be that the day’s work consist of digging up a swale for the water that runs through the land, to stay in the land instead of it becoming polluted and wasted. Or you may spend a day having fun with soil, chopping and dropping excess plant growth to let the matter return into the soil to feed the soil life. Lets look at our biosphere. Do you think we would we treat it differently if we saw it as a combination of universal, sacred healing elements? Could we work with it and use it with greater respect? Would we be compelled to study it in greater detail and reverence? If we had this heightened perception of it ? Well how could we start ? To begin it is important to understand the health of water and soil with in our biosphere these are the two elements that our body depends on for its building blocks. If it was not for soil we would have no food and if it was not for water we would have no life period. 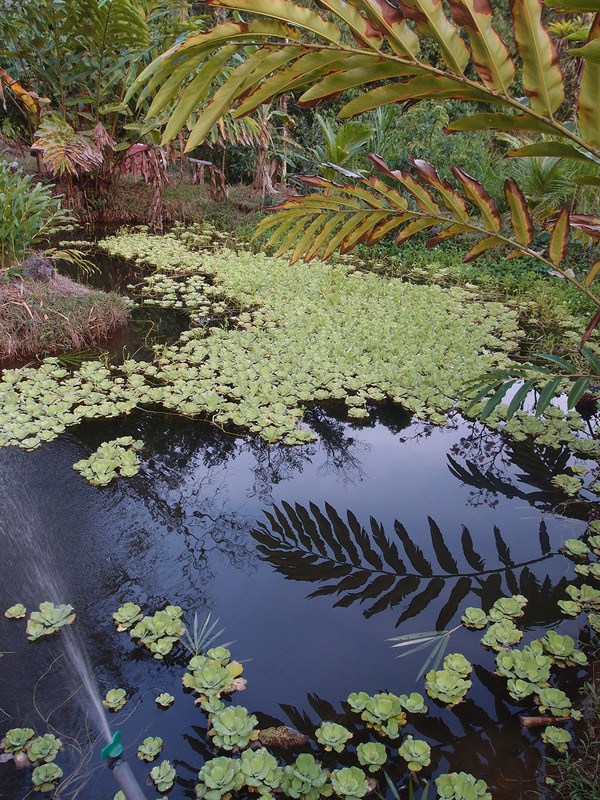 Ponds created at VerdeEnergia to amplify the ecosystem in it and around it! These are 2 resources that are in great danger today with water being polluted and aquifers being sucked dry and soils being eroded, poisoned and salted by the use of toxic chemicals. It should be in our first line of priorities to learn how to care for these elements if we want to continue living in this planet as a species for untold generations. Designing for water is a crucial aspect of permaculture design. All life needs water, and water is always flowing. Good design helps filter water, and channel its flows to nourish life rather than to destroy it. By studying and understanding water dynamics, we can harness its regenerative power to nourish life rather than having poor water design destroy life such as in the case of flooding, mudslides, and soil erosion. At Verde Energia Pacifica permaculture farm and jungle reforestation project my eyes were pleased to see the ditches that were dug up along the slopes of hills, these are called swales on contour, they slow down the force of water and give it time to be absorbed as water fills one swale and then overflows to the one below it , in this farm the final swale overflowed water to fill 3 heart shaped ponds again one above the other to use gravity’s force to allow it to travel downward. This water soaks into the soil and maintains the natural moisture of soil substituting artificial irrigation. 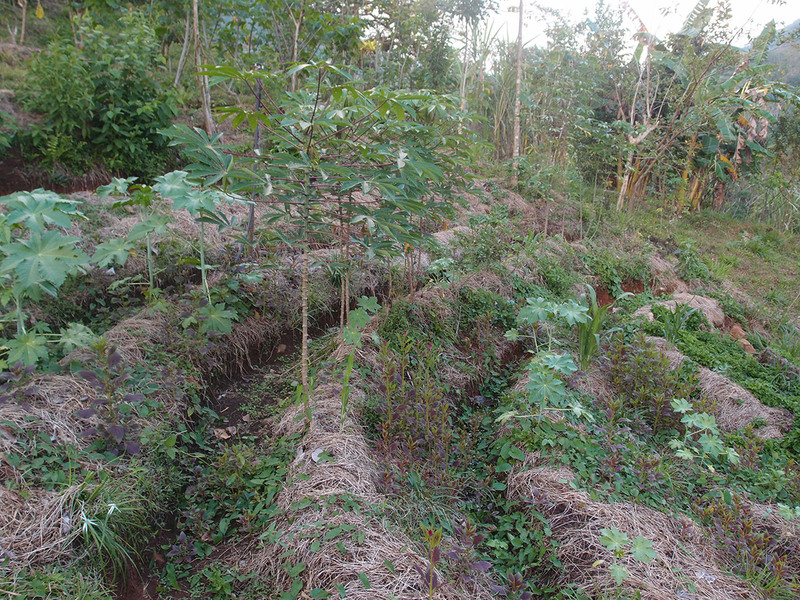 The swales are planted lining the edges with naturally occurring pioneers or planted vegetation such as Castor Beans (fix nitrogen), Chaya (dynamic accumulator), grasses such as Sugar Cane, Lemongrass, Vetiver (which will provide biomass and retain soil) Sweet potatoes as (cover crops) Yucca and other tropical staples. This water management system reduces water run off by 85% and increases the capacity of soil to store water by 75%. Swales at VerdeEnergia to harvest water on a slope. What about soil? Soil has been overlooked in our modern society. Industrial agriculture doesn’t respect the soil’s contribution to nutritious food, and has allowed it to wither. In fact, it’s the soil that does most of the work in growing fresh, nutritious food – it creates plant nutrients, filters water, and decomposes fresh organic matter into more nutrients. The soil food web is the backbone of a healthy soil ecosystem. Interestingly, soil is mostly water, so water issues are vital to soil. Soils are a complex mixture of diverse rock types which depending on the given geography will give sand, silt or clay in combinations of varying proportions. These 3 rock components have locked with in them various nutrients for plants, but they are not available to plants if the soil life is not rich and thriving. There for to give plants their appropriate needs our soil must be filled with beneficial organisms. In order to feed the soil organisms we need to provide plenty of organic matter also the proper supply of water since it has a key role in rock break down, water swells up the rock and causes weathering of the rock so the minerals are released into available nutrients. When watering from below as in the case of sinking water from swales and ponds there’s more rock break down and release of nutrients than when surface watering such as sprinklers. Every square meter of forest topsoil can contain 1000 species of insects. Disturbed compacted soils low in oxygen favor bacteria growth over fungi. Organic matter on soils favor Fungi and it is a preferred species since they are more effective in wood and large plant material breakdown. They can take nitrogen and transport it into decaying wood for faster decomposition. They also transport nutrients into higher plant life via intimate contact with the root cell of the host plant. Death of the soil organisms also feed the soil as they return to the earth. It was very pleasing to see the loads of organic matter being applied onto the swales, gardens, and food forest to protect and feed the soil food web in the farm, since mulch is essential to maintaining soil crumb structure, buffering ph and increasing sugar content. Improving the taste and nutrition of vegetables. • Water absorption is improved under mulches. Reason why swales are filled with mulches. • Ants and termites reduce the mulch to humic acid feeds fungi meaning underground storages in fungi. Humic acid improved plants root development. • Under mulch soil temperatures are buffered-being cooler by day and warmer at night. • (NPK) Nitrogen, Phosphorus & Potassium levels remain satisfactory. With a little creativity, soil and water can be managed and restored efficiently and almost effortlessly. It is fulfilling to see permaculture farms such as Verde Energia and Rancho Mastatal drawing a new model to follow as we shift our path from deteriorating the landscape with harmful farming practices to just thinking simply and mimicking what nature already does. These places do not only serve as farms but as ecological resorts that serve as gathering and educational places for ecological, and social purposes. In this new paradigm towards a new world whole system designs are woven into these educational centers, stacking functions.